Sims Metal Management has filed amendments to its 2012 annual report to restate its consolidated financial statements and notes for the past three years, as previously announced, after a special committee investigated inventory valuation issues in the UK business. The amended sections are Item 3Key Information, which gives five year revenue numbers; Item 5Operating and Financial Review and Prospects which discusses the principal factors that affect the results of operations; and Item 18Financial Statements. Shares in ERM Power jumped to an all time high of $2.64 on 19 March. Soon after, 1,346,823 unlisted options were exercised at 80.6 cents each. Infigen Energys has rebutted assertions by Origin Energy about wind power and the renewable energy target, saying that wind farms are typically supported by the vast majority of the local communities where they are located. It has also welcomed the Climate Change Authoritys recommendations about the Large scale Renewable Energy Target. South Australia has achieved over 25 per cent of its electricity from wind energy without adding a single megawatt of open cycle gas generation to provide reliability, and at the same time wind energy has reduced the price volatility and wholesale cost of electricity, said Mr George. He also points out the renewable energy target was established by a Liberal Government not only to reduce emissions but to promote the development of the renewable energy industry. Wind farms are an excellent provider of carbon emission free electrical energy to the grid and comparing a wind farm to a diesel peaker or coal fired power station is akin to comparing an Americas cup yacht to a Jet Ski or an oil tanker. Each serves a different purpose and is effective when deployed for that purpose, he said. The independent Climate Change Authority recommended no change to the RET scheme, and the Governments acceptance of all of its recommendations for the Large scale Renewable Energy Target (LRET) will deliver regulatory certainty essential for new investment in renewable energy. Origin had an opportunity to make its case to the Authority and it is a disservice to the Authority to suggest that it skipped an opportunity to review the true cost of the scheme, said Mr George. It is reassuring to see the Government is following the recommendations of the CCA that are based on independent economic modeling. That modeling showed that lowering the LRET, as promoted by companies with deep gas interests, would result in a lose lose lose outcome for investment, emissions reductions and cost to consumers, said Mr George. Australia stands to gain $18 billion of investment and 10,000 jobs over the next decade from wind energy projects generated as a result of the LRET, in addition to $4.25 billion of investment and 1,700 jobs already created in the industry. The CCA said reducing the legislated LRET target of 41,000 Gigawatt hours would increase carbon pollution by 119 million tonnes over the life of the scheme. Shares in Carbon Conscious fell to an all time low of 4 cents on 19 March. Volume was very high. Greencaps shares jumped over 1 cent or 25 per cent on news of a strategic review to increase shareholder value. It says value could be achieved by reviewing different ownership alternatives such as a transformational acquisition, considering approaches by third parties, a merger with a complementary business, or privatization. Miles Advisory Partners has been appointed as advisers for the review. 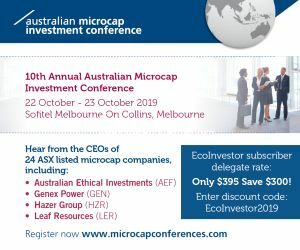 Miles previously assisted Greencap with the disposal of its discontinued operations and can advise on acquisitions, mergers and approaches, divestments, and capital structures that maximize the outcome for shareholders. Despite recent initiatives such as a restructuring of senior management, reduction of service delivery costs, alignment of business locations with growth markets and others, the board believes the market has not recognized the companys underlying value. Pacific Energys share price spiked to a new five year high of 54 cents on 20 March. Shares in Galaxy Resources fell to a three year low of 34.5 cents on 21 March, two days after the company announced a three year spodumene feedstock contract with Talison Lithium to by spodumene for its Jiangsu Lithium Carbonate Plant in China. Galaxy will purchase the feedstock in US dollars, which has cost benefits. Galaxys own Mt Cattlin was developed as a feedstock provider for Jiangsu, but it was placed in temporary suspension in July 2012 due to high inventory levels of spodumene at Jiangsu; and an over 40 per cent deterioration in the exchange rate has pressured the cost of local production. The new contract will deliver spodumene from Talisons Greenbushes mine in WA to Jiangsu at a better rate compared to the cost of a full reinstatement of the Mt Cattlin operation in Ravensthorpe. Galaxy said Talisons recently expanded capacity and threefold head grade at its Greenbushes operations has resulted in the first significant external supply of spodumene becoming available on the international market. The contract is expected to begin in July after existing stockpiles at Jiangsu have depleted. Mt Cattlin will remain suspended but ready to restart if Galaxy needs to resume internal production, and for security of supply. Australian Renewable Fuels directors Michael Costello, Julien Playoust and Andrew White participated in the companys recent entitlement offer. Clean Seas Tuna Ltd has launched a renounceable entitlement issue to raise up to $3.6 million. The three for five offer is at 1.2 cents per share. The funds will be used to increase Yellowtail Kingfish production. The issue is partially underwritten to $1.8 million by Patersons Securities Limited, which is also lead manager for the issue. Nanosonics said its trophon EPR sterilizer has been endorsed as ground breaking in the US based Scripps Health network sites where it has been installed. Scripps is a $2.6 billion private, non profit health system in San Diego, California and treats 500,000 patients annually at five acute care hospital campuses and 24 outpatient centers and clinics. It is said to be ranked among the top tier in US medical facilities. Scripps installed 21 trophon EPR devices as part of its initial roll out and plans to introduce significantly more as moves from a manual to fully automated disinfection of ultrasound probes. Eric Rosenberg, manager of the Scripps Gooding Imaging Center in San Diego, said the trophon EPR has improved the efficiency of cleaning processes, created more standardization and eliminated non value added variation, and also reduced the chances for human error. Importantly, it has reduced exposure to harsh chemicals previously used during the manual cleaning process. Shares n Po Valley Energy fell to a low of 10 cents on 20 March, two days after it announced its financial results for the year to 31 December 2012. This included a maiden profit of Euro 2.37 million or $2.94 million against a 2011 loss of Euro 5.07 million. Revenue was Euro 8.20 million or $10.18 million, down from Euro 9.11 million. Net cash flow from operating activities was Euro 4.34 million, up 33 per cent on 2011's Euro 3.26 million. Cash at 31 December was Euro 1.22 million or $1.55 million. RedFlow said the development of its core battery technology continues and testing results show improved efficiency and power throughput, but further improvements are needed to have a fully commercial product. The company is now sourcing 75 per cent of its components by value from external suppliers and is targeting 90 per cent by the end of 2013. The company has a shortlist of five potential contract manufacturers, and it expects to see an initial 25 per cent reduction in the cost of manufacturing its finished product. A final decision on transfering manufacturing to a contract manufacturer will take at least 3 to 6 months. The company is now looking for strategic or cornerstone investors with the skills, experience and financial capability to assist it to bring its battery to a commercially ready state in its largest markets. RedFlow said a competing product for its ZBM module is the EnerStore system from US based and NASDAQ listed ZBB Energy. RedFlow believes EnerStore is a similar product at a similar stage of development although no public information is available about the batterys performance. Their recent sales and shipments, when combined with our recent orders and shipments, confirm that market interest in this new emerging technology is developing and is gaining the attention of system integrators and end customers alike as a potentially efficient, longer term solution to a growing global problem, said RedFlow. The Federal Court of Malaysia has confirmed the earlier decisions of lower courts to dismiss a challenge to Lynas Temporary Operating Licence (TOL) by people from the Save Malaysia Stop Lynas group (SMSL). In April 2012, the Kuala Lumpur High Court dismissed an application by SMSL for leave to seek a judicial review of the decision of the Atomic Energy Licensing Board to approve the TOL. On appeal, the decision of the High Court was upheld by the Court of Appeal in September 2012. The Federal Court has now dismissed an application by SMSL for leave to appeal the earlier decisions of the lower courts. Orocobre has announced a new Borax product that can be used in nuclear plants. Earlier this month subsidiary Borax Argentina SA made the first shipment of Boric Acid HPN (High Purity Nuclear) Grade to a customer in Brazil. Boric Acid HPN is a new refined chemical product developed by Borax Argentina over the last six months with high purity greater than 99.9 per cent and low levels of key impurities such as iron, sodium, chlorine, sulphur. Heavy metal levels are less than one part per million. The high boric acid content and low impurity levels makes it suitable for nuclear power plants, where boric acid is used to slow down the rate of fission. Boric Acid HPN will form an integral part of the product portfolio as Borax Argentina becomes more geographically diverse by growing its presence in key international markets, said Orocobre. This follows the recent development of a high grade hydroboracite product for the agriculture market. Borax can be used for environmentally positive uses as well as in less desirable situations. Algae.Tec has signed a Memorandum of Understanding with engineering firm WorleyParsons to help it develop its algae to fuel projects. A number of Algae.Tec projects in the EU, USA, Australia and Brazil are in the final stages of technical feasibility studies, and this agreement will establishes the framework for WorleyParsons to support Algae.Tec with the future development of these projects. Algae.Tec was ranked by Lux Research as the leading algae business in 2013. AnaeCo has been engaged by a private company to undertake a Project Definition Study into the viability of deploying its DiCOM Advanced Waste Technology for a 200,000 tonnes per annum plant at an existing facility in Southern Australia. Useage would be under licence. Managing director and chief executive Patrick Kedemos said We are pleased to have the opportunity to work with such a progressive company which understands the business of waste management and is able to move quickly. Carnegie Wave Energy has raised $9.5 million including $8.5 million from its share purchase plan (SPP) and $1 million from a private placement. Carnegie had initially aimed to raise $6 million from the share purchase plan. The private placement was to a group of sophisticated investors, the majority of whom are existing Carnegie shareholders, and was on the same terms as the recently completed and oversubscribed share purchase plan. Hot Rock has been granted a further geothermal exploration authorization in the Huisco area of Southern Peru. This brings its granted authorizations in Peru to six. The Huisco prospect is located at the northern end of the active volcanic belt in Southern Peru. Evidence is that the prospect is a medium to high temperature, fracture controlled, and hot water geothermal system. Hot Rock will commence community information programs and discussions with local land owners to obtain land access. An application has been submitted for environmental clearance to allow detailed geoscientific surveys. When these have been satisfied, Hot Rock will commence geoscientific surveys in the field season which runs from early May to the end of November.